In the Atlanta metropolitan area, a “999” or “triple 9” is the code for a cop being down, and that serves as the eventual catalyst for the main event in this somewhat mundane, star-laden crime drama from director John Hillicoat (Lawless). son, and she is threatening her nephew unless Michael does what’s she wants. She’s working with the feds, and her husband needs files being held by the Department of Homeland Security in order to be released from prison, so she needs Michael and his crew of dirty cops to do another job – break into the DHS. The only option for the crew given the response time is to “pull a triple 9,” meaning they have to kill a cop, which will draw every cop in the city away from their target. Meanwhile, Woody Harrelson plays a grizzled detective who just may be getting onto their scent, but can’t quite put the pieces together. There are a lot of things in this film that don’t really add up, say the least. We don’t really understand exactly why a Russian mobster’s wife is embedded with Federal agents and still making deals with corrupt police officers to kill other police officers and break into the department of Homeland Security. Casey Affleck plays a cop transferred in from another department who is partnered with Anthony Mackie’s corrupt cop character, and for whatever reason, we have another member of the corrupt crew who is poised to blow their cover show up at Affleck’s house while he’s being tailed. All of the moments in this film just seem to be ridiculous setups only to push forward to the good parts—the action. And the action is good. But, it’s not good enough to overcome what is an unnecessarily complicated film. And the twist ending is just a little too silly to take. Triple 9 was shot on various Arri HD cameras at 2.8K resolution and a 2K DI was utilized. It was also shot in the anamorphic format and framed at 2.40:1. It’s brought to Blu-ray in an AVC 1080p encodement from Universal that has a filmic appearance, as if perhaps a bit of artificial grain was added to give it a little bit of grittiness. Some black crush is apparent making some dark scenes lose some of their detail and look just a little flat. Apart from that, there is a lot of texture and pretty good colors in this transfer and no issues with banding or edge enhancement. Triple 9 comes with disappointing set of extras that bring nothing much to the table. A brilliant cast in Triple 9 offers up the best performances they can in what is regrettably just an average crime drama. The screenplay trips over itself at all times. On the positive side, this Blu-ray is a fine release. 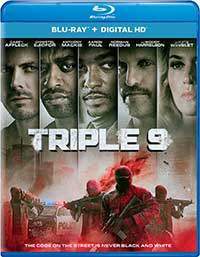 Plot holes and silly plot twists make the star-heavy crime drama Triple 9 no more than an average affair.